Earthlink Wireless Launches BlackBerry 7750 with Data and Voice | BlackBerry Blast! EarthLink today announced the launch of the all-in-one color BlackBerry 7750 Wireless Handheld TM with wireless email and voice service. Using the BlackBerry® platform, designed and manufactured by Research In Motion (RIM) (Nasdaq: RIMM; TSX: RIM), the new EarthLink offering combines phone, email, Internet access and other applications to make EarthLink the first ISP to offer a complete wireless data and voice solution. In addition to being sold, supported and provisioned by EarthLink, the new offering features EarthLink’s suite of protection tools. Included in this suite, exclusively available to EarthLink customers, is EarthLink spamBlocker, which blocks virtually 100 percent of unwanted email messages at the server. 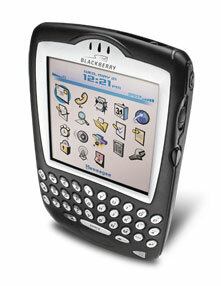 The BlackBerry 7750 from EarthLink Wireless provides users with phone, email, text messaging, Web browser and organizer applications in a compact, intuitive, easy-to-use handheld that includes: a large, high-resolution screen and vibrant display – supporting more than 65,000 colors, integrated attachment viewing, exceptional battery life, a backlit QWERTY keyboard for fast text entry, and other features. EarthLink Wireless’ pricing plans, which include unlimited data, start at $39.95 per month, and for an additional $39.95 per month customers get 500 anytime minutes with no roaming fees and free night and weekend calling In addition, customers can bring their mobile numbers with them when they switch their existing service to EarthLink Wireless and can rely on support from a dedicated BlackBerry®-trained support team. For more information or to sign up, visit www.earthlink.net/wireless or call 1-800-EARTHLINK.